EXOTIC landscapes and people are the focus of artist Tony Walker's exhibition From Oz To Orient, open now at the Harbourside Gallery in Noosa Marina. Walker (pictured above) is displaying paintings of scenes from Noosa, remote Australia, China, Vietnam and more. 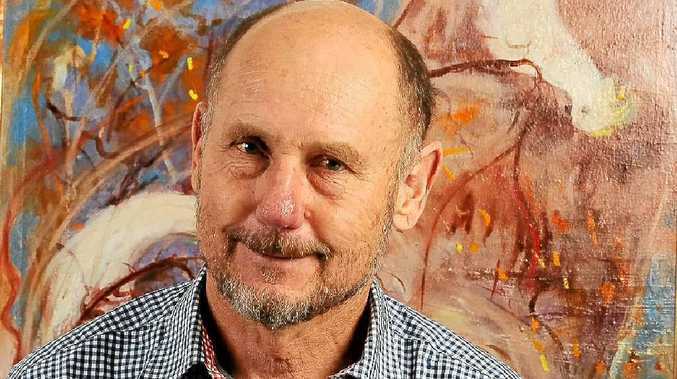 "These paintings originate from my work on site in which I endeavour to capture, not just the visual but the spirit of the landscape or culture," he said from his "wilderness" studio on Noosa North Shore. In relation to his recent trip to China, he said: "I elected to travel minus easel, confining myself to the quarter-sheet-on-lap-balanced-on-rock approach. "This worked well and contributed to the interpretation, and not only by discouraging exactness. "Creativity there is certainly encouraged by the surreal landforms with multiple misty khasts evocatively arranged around in the landscape and reflected in the Li River. "The strange but beautiful landscape is undeniably influential in the culture, and the visiting artist - or at least this one - looks for ways of incorporating the ambiance in the sketch. "This may be what we do everywhere, but seemed obligatory on the Li River. A degree of interpretation can help to present reality better than strict realism, which is a point I wanted an excuse to make."